This week I am taking a break from my collection of jewelry tidbits for an SCA moment. For anyone who does not know, the SCA is a non-profit educational organization that does Pre-1600’s Reenactment. This week a friend of mine posted an SCA version of a trivia game that discussed details of our SCA careers, and I was inspired. So here is my list of just a few of what we call “Stardust Moments”. The magic that makes us play this crazy game. 1. It was our first year going to the Pennsic War in Pennsylvania. Imagine a field four times the size of a football field, full of people in Medieval clothing, carrying hundreds of banners and pennants, some groups silent and others marching to a song. This is Opening Ceremonies at Pennsic… pure magic! 2. It is the beginning of the field battle at Pennsic. Over a thousand fighters standing on the field, banging their swords on their shields and yelling before they advance on one another. The sound of the physical impact of the two battle lines crashing into each other is monumental, probably the closest that most modern people will ever come to the sheer adrenaline rush of massed combat during the Middle Ages. In the old days the lines of fighters were allowed to run at each other at full speed, but that was changed a few years ago when the powers that be realized that there were just too many injuries from the impacts. 3. Our first Gulf Wars in Mississippi. We heard that there was going to be a procession so we went to watch. Now we have seen LOTS of processions, and been in more than a few ourselves, but this one…imagine a procession of Royalty – Kings and Queens, Princes and Princesses, Barons and Baronesses, all on horseback. The horses, decked out in their heraldic barding, some of the gowns and other clothing specifically designed to be worn on horseback. Amazing! 4. At a small local event my husband and I mentioned to the group that we wanted to include the children in the pageantry. In the morning I asked one of the boys if he wanted to help us in court. He walked in the procession with us, throwing packages of gummy bears to the assembled populace and then standing guard for us with a sword. I don’t think his feet ever touched the ground. The look of pure delight to be included in something “important”, and have the opportunity to throw gummy bears at people, was just too good. He has grown to be a fine upstanding young man that we can always count on for assistance. 5. And the breaking of stereotypes. At Gulf War Wars several years ago a large fighter stood in my booth and my husband asked him “So what do you like to do when you aren’t hitting people with sticks?” His answer? “Well I embroidered my tunic, and I made my leather shoes, I really like brewing, and I would like to learn to weave.” Yes, he is now a friend that we look forward to seeing every year. 6. And then there are the rescues – during set-up at the Pennsic War, a big storm rolled in. Our pavilion top was up and secure, and I was in the process of putting on the walls. Suddenly the rain just started pouring down and the wind hit hard. There was a lot of hollering and scrambling as one of our neighbors garage tents started to take off in the high wind. I looked to see if there was anything that I could do, but there were already several sturdy men, including my husband, who had run to the neighbors rescue. I went back to quickly putting the walls on, to provide a place for folks to get in out of the rain. The rain was literally pouring off of the roof of the pavilion and down my arms. Several people dove into our pavilion to get out of the rain, and we all waited the long minutes until most of the excitement was over. The rain stopped as quickly as it had started and everyone immediately began running around and helping their neighbors. Pavilions were put back up. The neighbor’s garage tent, which had been saved, had still managed to move sideways over eight feet. We put a person on each of the six legs, walked it back to where it belonged and then quickly anchored it so that it would not go anywhere for the rest of the war. We all scrambled and helped both friends and complete strangers without a thought. That is what we do. THAT is the magic. Now I don’t want to give people a false impression by any of my statements. These things are not just a “one off” experience. 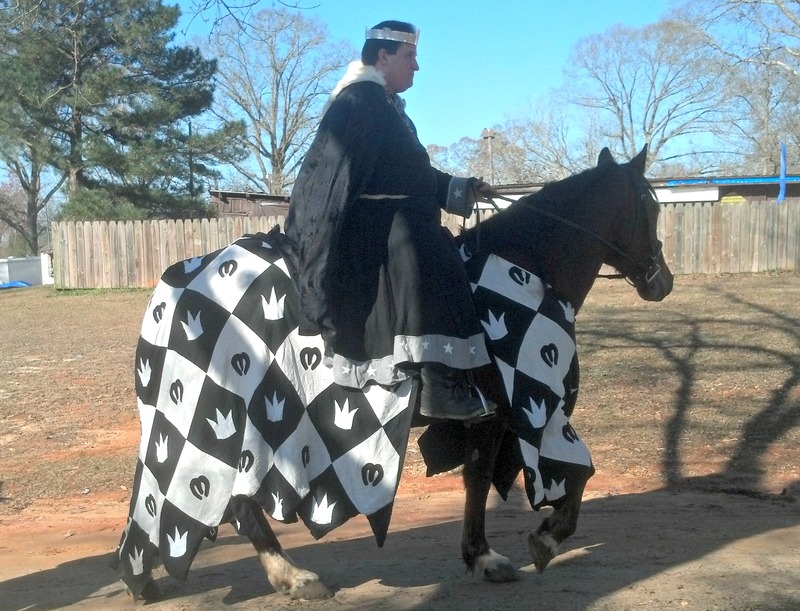 My heart still leaps with joy every time I see those horses at Gulf Wars or the banners at Pennsic. The same sort of “rescues” and quiet moments of delight happen at the smallest gatherings as well as the largest wars. It is the feeling of family and magic that keeps us coming back. I hope that you too can experience the magic!